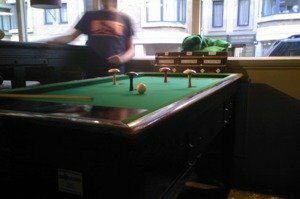 Bar Billiards is a form of Billiards that is also known by the name of Russian Billiards and is a game that is popular in the UK, particularly the south of England and the Channel Islands. The game originates from the game of ‘billard russe’ in Russia which was seen being played in Belgium by an English gentleman by the name of David Gill, who subsequently brought the game to the UK in the 1930s. Played on a table that resembles normal Billiards table but differs in that instead of pockets, holes are sunk in the table, the rules and administration of the game is overseen by the All England Bar Billiards Association, which comprises of a number of county associations including Kent, Norfolk, Surrey, Hampshire, Oxfordshire, Northamptonshire and Buckinghamshire. There is a Bar Billiards World Championship held every year on the island of Jersey, which despite the name, is competed by players almost exclusively from the UK. The object of the game is simply to defeat your opponent by scoring more points than them by the time the game finishes. As it is a game that is almost exclusively played in pubs, many people play it just as much for the social and fun aspect of the game, as well as the serious competition aspect. Bar Billiards is played on a table that closely resembles a small Billiards table and measures 56” x 33.5”. Unlike a normal Billiards table that has six pockets around the edge, a Bar Billiards table does not have any such pockets and instead features holes sunk into the table. 5 across one end of the table in a row and four in a diamond pattern on the other half of the table. The holes have differing points values if a ball is potted in them ranging from 10 points to 200 and when a ball is potted in them, they roll into a trough at the end of the table. The balls used in Bar Billiards are similar to those used in Snooker and Billiards, and there are seven white balls and just one red ball. The particular skittle formation often depends where the game is being played, with different areas of the UK preferring different arrangements. Scoring is done by a player taking a shot by taking a white or red ball from the trough at the end of the table and then striking it with the cue with the aim of hitting another ball on the table resulting in a ball going down a hole. The player received the amount of points that the hole the ball goes down is worth. Players usually choose to play with a red ball as this doubles the number of points for each pocket. If any of the above occur, then the player finishes their turn and loses all the points that they earned during that go. If a black skittle is knocked over as well, then their entire screen goes back down to zero. Games of Bar Billiards are usually played on a coin operated machine with the machine only being able to operate for as long as it is being paid for. One payment usually lasts for between 15 and 20 minutes, which means that the winner at the end of the time with the most points is declared the winner. The start of a game of Bar Billiards is delayed until a flip of a coin has been done to decide which player starts. The player who has been chosen to start takes a white or red ball from the trough at the end of the table, places it in the D and then hits the ball with the aim of striking another ball which results in one of the ball's going down a hole and scoring a point. If a player makes a scoring shot, then they are entitled to another go and remain at the table until they fail to make a scoring shot or foul. The opposition player then takes their turn at the table, picking a white or red ball to hit to try and hit a ball resulting in one of them going down a hole and scoring points. This player will remain at the table until they don’t make a shot that scores or commit a foul. The players continue to take turns at the table in this manner, scoring points until the game time runs out and the Bar Billiards table stops working. The player with the best score at the end of the game is declared the winner.